Price is subject to change and does not reflect 20% service charge and current sales tax. Maximum of two protein entrées plus a vegetarian option Price is subject to change and does not reflect 20% service charge and current sales tax. VANILLA, CHOCOLATE, OR SPUMONI ICE CREAM SMALL ASSORTED CHEESE CAKES Rich indulgent, smaller portions of our favorite assorted cheese cakes CHOCOATE MOUSSE Light, chocolate truffle mousse with rich fudge, creating a layer of pure decadence CHEESE CAKE WITH FRUIT GLAZE Cheesecake swirled with a savory sweet fruit glaze STRAWBERRY SHORT CAKE Spongy cake with smooth whipped cream, glazed in a strawberry sauce INDIVIDUAL BISTRO COLLECTION RED VELVET LAYER CAKE Topped with a rich cream cheese mousse, a swirl of light and fluffy whipped cream, and red velvet cake crumbs TIRAMISU Small serving of light and airy sponge cake layered with espresso-flavored mascarpone mousse, whipped cream, and a dust of cocoa LEMON CREAM LAYER CAKE Lemon-infused sponge cake topped with smooth whipped cream and sprinkled with crunchy lemon candies STRAWBERRY CHEESECAKE CREAM A chocolate cookie crumb crust, layered with strawberry cream mousse, topped with whipped cream and chocolate shavings CARROT LAYER CAKE A moist, flavorful cake with shredded carrots and a cream cheese filling CHOCOLATE LAYER FUDGE CAKE Rich and creamy chocolate cake with a fudge filling and a chocolate outside layer RUSTIC TRIPLE BERRY APPLE TART Individually portioned tarts baked to perfection, sugar glazed, and topped with coarse sugar HOUSE MADE SALTED CARAMEL BREAD PUDDING Succulent house made bread pudding with salted caramel sauce has a perfectly moist, creamy interior with a crisp outer crust. The brioche bread is the secret to this velvety-rich interior. -$350 bar minimum includes private bartender, bar liquor, mixes, glassware, garnishes and cocktail napkins. -Cash and hosted bar options are available. -Beverages are charged upon consumption. -Hosted Bars are subject to a taxable 20% service charge and sales tax. -Individual purchases may be made by cash or major credit card. Choose Hotel Piccadilly as your ceremony site destination and we will provide: WEDDING CEREMONY SITE BEAUTIFUL OUTDOOR SETTINGS WEDDING ARCH CLASSIC GARDEN CHAIR SEATING CITRUS INFUSED WATER STATION WEDDING CEREMONY REHEARSAL Ceremony coordinator available for $50 per hour Ask your wedding specialist for additional package upgradesto include: custom chair covers, sashes, chivari chairs, etc. Tax & service charge included in the per person price. Price is subject to change. Price is subject to change. Tax and service charge included in the per person price. Maximum of two protein entrees plus a vegetarian option Price is subject to change and does not reflect 20% service charge and current sales tax. With comfortable chairs, complimentary water, and note pads/pens; this room makes the perfect space for a conference or business meeting. In this secluded outdoor patio area seating up to 70 guests, one can enjoy private events while surrounded by beautiful scenery. Our sparkling lights will set the mood among family and friends. Perfect for wedding ceremonies, engagement parties, intimate celebrations, etc. Special Features: Portable heaters available upon request, please call for pricing. Our Director's Room is a spacious area great for conferences, weekly meetings, or small parties. There is also a small area beside the entrance perfect for setting up buffets, snacks, and beverages. Hotel Piccadilly is a pet friendly hotel located in Northwest Fresno, in the heart of Fig Garden. 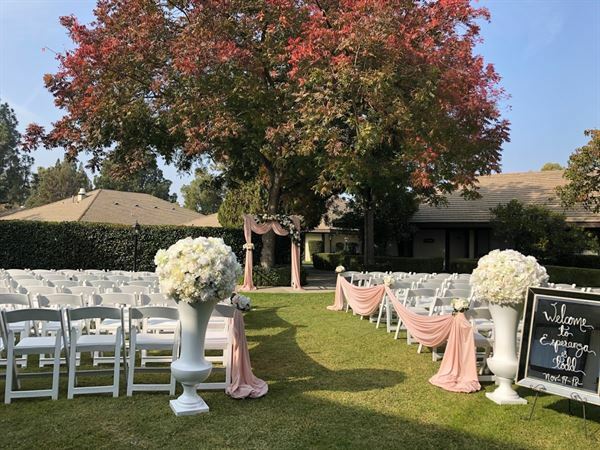 The hotel is 10 miles from Fresno Yosemite International Airport, 7.5 miles from Fresno Convention Center, 90 miles from Yosemite National Park, and 65 miles from Sequoia and King’s Canyon National Park. For over 30 years, Hotel Piccadilly's foundation has been built on style and gracious service. Hotel Piccadilly offer its guests their choice of 185 rooms, ranging from luxurious suites to family and pet friendly rooms. It is also home to The Restaurant, formerly known as Oliver’s Pub & Restaurant, which features a full bar and our new Spanish-styled Tapas menu, created by our Executive Chef, Daniel Thomas. Property amenities include swimming pool and heated spa as well as a 9-hole putting green for golf lovers. Stay with us, and you will experience comfort and convenience. Hotel Piccadilly's Garden Courtyard is spread out on a luscious green lawn, surrounded by trees providing shade and the perfect setting for intimate gatherings. As soon as you step into our Providence Room, you can take in its beautiful rustic layout. With white furniture, a large round table, a mini refridgerator, and a sparkling chandelier above; this room is fantastic for small bridal or baby showers, food tastings, tea parties, and much more. The Regency Ballroom is our largest banquet room. This room can be split into half and into four quarters. Spacious enough for a dancefloor and live bands as well. Most popular for weddings, seasonal parties, memorials, reunions, formals, and more. Atmosphere/Decor: Half Room & Quarter Room Also Available For Booking. Our Executive Room is a spacious area great for conferences, weekly meetings or small parties. There is also a small area beside the entrance perfect for setting up buffets, snacks, and beverages. Our newly renovated Crown Room is a spacious area floored with tile, provides natural lighting from the ceiling and windows, and shares a door to the lobby for easy access. With a beige and white color scheme, this room is perfect for any event. From the initial meeting with the Catering Department, throughout the entire event and all the way to the post event follow up, the staff at Hotel Piccadilly was excellent! They made sure to accommodate our every need! Thank you for the kind words! We look forward to working with you again! Pretty great place for staying in Fresno. Rooms were clean and spacious. Breakfast was substantial with eggs, potatoes, sausage pancakes, etc. Housekeeping staff were amazing and so helpful with requests. No elevator so beware of staying above the first floor.